The Target Marketing Systems Two-Toned Country Cottage Rolling Kitchen Cart with 4 Drawers, 2 Cabinets, 1 Towel Rack, 1 Spice Rack, and an Adjustable Shelf is the Perfect Addition For Any Home. Equipped with 4 Drawers, 2 Cabinets, 1 Towel Rack, 1 Spice Rack, and an Adjustable Shelf, the Kitchen Cart has Everything You Could Possibly Need. No need to Take Apart the Kitchen Looking for Extra Plates or a Certain Spice. The Accessory Drawer and Spice Rack are the Perfect Place to Store those Items. Have an Accidental Spill? Good thing the Rolling Kitchen Cart has a Towel Rack and You've got the Towel at the Ready to Clean Up the Mess. Hosting a Wine and Cheese Party? There's more than Enough Space for those Items on Top of the Cart! Equipped with 4 Caster Wheels, with 2 that Lock, the White Kitchen Cart is an Absolute Dream that can be Easily Transported into any Room. Made with High Quality MDF with a Veneer Coating, the Cart is also Durable and Strong. Little Knocks won't do much damage here. Since 1985, Target Marketing Systems has been Offering Top-Notch Furniture at Affordable Prices. That Goal has not Changed and TMS will Continue to Give You the Best. 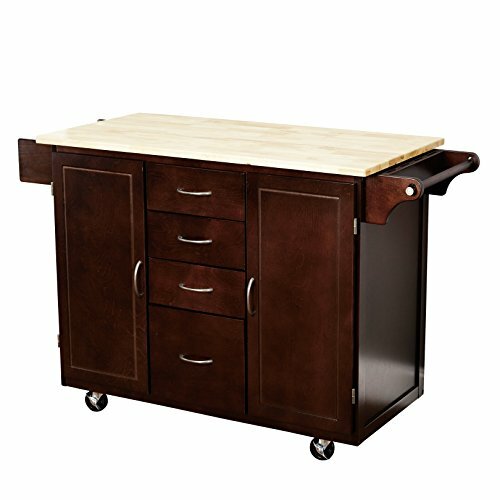 The Kitchen Cart Measures 23" X 54" X 36" and Weighs 112 Lbs. Arrives with Only Minimal Assembly Required. A Stylish and Functional Piece, the Rolling Kitchen Cart Offers Additional Countertop and Storage Space in Your Kitchen. Equipped with 4 Drawers, 2 Cabinets, 1 Towel Rack, 1 Spice Rack, and an Adjustable Shelf, the Kitchen Cart has Everything You Need. Equipped with Four Caster Wheels with Two that Lock, the White Kitchen Cart is Mobile but also Secure so there is No Need to Worry it will Roll Away. With a Two-Toned Finish of Espresso and Natural Wood, the Kitchen Cart is a Modern Piece for the Modern Home. Made with High Quality MDF with Veneer Coating, the Kitchen Cart also Features a Strong Rubber Wood Top.